We have an extensive range of savouries to satisfy all tastes. Try our Classic Kiwi Savouries range that includes everyone’s favourites, our Hub Cutie Pie range for something more gourmet, our SunnyDays Party Pack Combo which are insanely good value or our Party Bites unbaked frozen free flow sausage rolls. Our Cutie Pies are wickedly tempting so when you want to impress your guests these are the ones to serve. 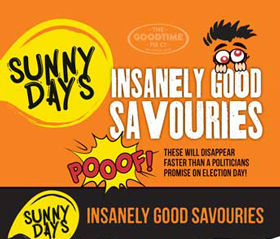 They are available in catering size packs either as individual flavours or a combo pack. 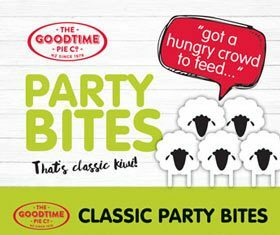 Keep the crowd happy with our extensive range of classic kiwi savouries featuring everyone’s favourites- They’re choice bro! They are available in catering size packs either as individual flavours or a combo pack. 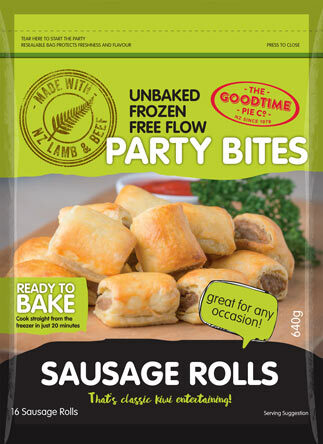 Our Party Bites Sausage Rolls are ready to bake, simply grab them from the freezer, bake and enjoy. This makes them very convenient and perfect for entertaining or family snacking. 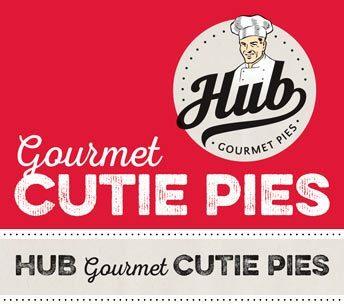 They are made with tender NZ beef and lamb and herbs and spices. Each pack contains 16 sausage rolls. Our SunnyDays savouries not only taste great but they are incredibly good value- the perfect savoury to serve when you have an insanely hungry crowd to feed.